Saul Wordsworth’s grandmother is a first generation immigrant with a dramatic past. She is also his closest relative. I too love Mi-ri-am very much. Growing up in Harpenden, Hertfordshire, she and my grandfather Raphael were only half a mile down the road. As an only child I was forever dashing round to their house to spend time with visiting cousins. She was a regular fixture at my birthday, each time baking the most incredible Victoria sponge with chocolate filling. Her refrain, “You don’t mean it!” pronounced “you doe min it” became a favourite catchphrase amongst the cousins. Later, when Raphael died and she relocated to Golders Green in north London, I moved in for a time to live with her. 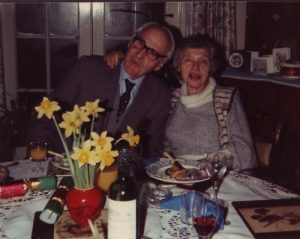 Soon after, my father and then my mother died and today, aged 96, Miriam is my closest relative. Hers is an incredible story yet not so different from many other immigrant tales. Born in the small Ukraine town of Zhitomir in 1914, Miriam Polianovsky’s arrival coincided with a dark period in Russian history during which Jews faced great persecution. Shelter had to be found from the regular pogroms that were a feature of the time. On one occasion the entire family was moved to a safe house and a bowl of sugar placed in front of the youngest for finger dipping in an effort to keep them quiet until the danger passed. When they returned home it had been ransacked. In 1919, two years after her elder sister, Esther, left for Palestine, dramatic news arrived; she was waiting for the whole family across the border in Poland with the necessary documentation to take them back with her. To reach Esther the Polianovskys had to split up and traverse the tricky terrain of the forest by night. Miriam remembers holding up her mother as their boots sank into the mud and fighting through bracken, of which she remains terrified. Guided by foresters who were paid considerable sums for the risk, they arrived at a farmhouse close to the border. Suddenly there was shouting and flashlights. The police were near. Miriam and her mother were ushered inside, the landlady making them climb into a bed fully clothed, complete with muddy boots. They pulled the covers up to their chins and feigned sleep. In 1996, soon after I left university my parents moved to Wales. I lasted a year in St Albans then decided I wanted to sample a spot of London life, but with added home comforts. “Do you mind if I move in?” I enquired down the phone, assured it would be a certainty. “I’ll think about it,” said Miri, and hung up. Three days later, aged 83, she agreed. Miriam, her mother, two brothers and two sisters made it to Palestine and set up home in the coastal town of Haifa. Aged five and the youngest child, she embarked upon what she describes today as an idyllic childhood, enjoying the freedom of this new land, absorbing herself in her education and mixing freely with Arabs and Jews alike. 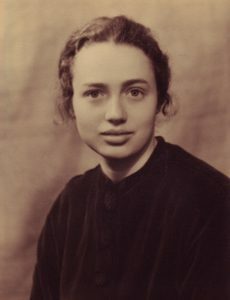 Soon after arriving there Esther and her other sister, Fania, moved to Germany where Esther began studying under Albert Einstein. Life, though, was already becoming dangerous for Jews under the Nazis and Einstein recommended the two sisters move to England. This they did and in 1930, at the age of 15 Miriam travelled to London to join her sisters for a short holiday, fleeing in part to escape the affections of a boyfriend whose family had assumed an early marriage, and leaving her mother and brothers behind. She didn’t return for thirty years. Once in London but knowing no English, Miriam enlisted at a school in Harley Street and moved in with her sister in Paddington. She also spent a good deal of time in Barley, Hertfordshire, with Esther and her new husband Myer Salaman. Myer’s father, Redcliffe Salaman, was an eminent English Jew and widower. He grew fond of Miriam and so did his son Arthur – but her interest was piqued by Arthur’s younger brother Raphael. “I can’t tell you how handsome he was or how nice,” she told me in 2008. “I’d been used to my brother Schlomo shouting whenever he wanted something. Raphael was such a quiet, gently spoken man.” They married in 1933, creating a double brother-sister partnership. Miriam was wise even beyond her advancing years and full of advice. Occasionally she would receive calls from the relatives in Israel. I would marvel as she switched seamlessly to the Hebrew that had lain dormant for seventy years. She remained the focal point of the family. Unusually for someone in her mid-80s she was never alone and received a steady stream of visitors. She was also surrounded by a retinue of helpers, one in particular travelling down every week from Harpenden to hoover the flat and prepare lunch. Mortifyingly for both of us, I once made a naked dash to the bathroom in the middle of the night only to encounter Miri on the landing. The next day she brushed it off, cunningly remarking that her eyes had not adjusted to the dark. By September 1998 it was time to strike out on my own. I moved out of her flat and up the road to Highgate, some three miles away. Two weeks later my father, who was born the same year as Miriam, died. Hers was a reassuring presence and no doubt helped me through a difficult time especially as my mother, her daughter, was by this time unwell and soon moved down to London to take up my old room. Tamara, my mother, was born in 1934 when Miriam was 19. For the first time in her life Miri didn’t feel jealous of her sister, Esther who had switched from science and was by now writing novels – or other sister, Fania, who was a philosopher and friend of Wittgenstein. “I was so happy,” she told me. “I loved having children and I knew I would focus on being a good mother.” One boy and two more girls arrived over the next fifteen years during which Miriam was compelled to leave London due to the war, settling in the less-threatened surroundings of Harpenden. Miriam experienced a traumatic beginning to her life and the legacy of persecution had left is mark. Even as a child I can recall her face pressed to the window, anxiously waiting for guests to arrive or Raphael to return. Back in 1939 the prospect of Hitler invading Britain was a terrifying one and she lived in a state of constant and debilitating fear throughout the war. By 1945, though, she regained her joie de vivre and life with her husband and young family became a source of great pleasure once more. As one by one the children left home, Miriam and Raphael settled into their twosome existence, joined for company by a poodle named Tina. Raph retired early and dedicated himself to compiling two definitive books about tools. They enjoyed the company of their nine grandchildren, and we all have fond memories of playing cricket and football in their sizeable garden, hurling crab apples over the house, and taking elevenses of hot Ribena with cheese and crackers. 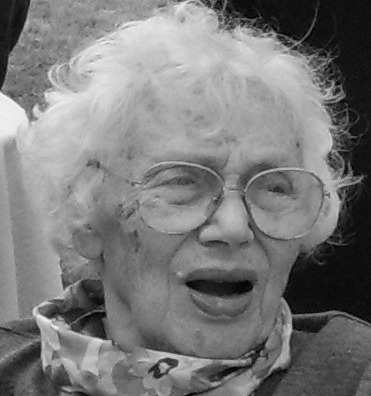 When my mother died in 2001 Miriam was bereft. “It is hard for a son to lose his mother,” she would say to me, “but it is harder for a mother to lose her daughter.” By now her existence had become more sedate. She undertook fewer excursions and was content to sit all day, watching television or reading the paper. She was, though, no less curious about the world and continued to dispense her wisdom where she felt it was required. “Your father was a difficult man” was a favourite, along with, “I shouldn’t have married so young” and, “Is it time for a whisky?” She would also reminisce about her earlier life in London. “Can we drive to Soho?” she would ask. “I used to live there.” According to Miriam she had lived on every street in London. In the aftermath of my mother’s death I came to depend on her more, as I did other members of the family. She was keen to talk about mum. “You should have seen her as a child,” she would say to me. “All the shopkeepers called her ‘The Dancer’. She would sing and dance all the time. Do you think she was happy living here in the final years?” The truthful answer was no’. She was ill and had very recently lost her husband, but there was nowhere else for her to go and the two of them found a way to make what was a difficult situation work as best they could. Miriam has a toughness about her and is unsentimental, but always very loving.